The nationally publicized Women's March On Washington occurred just over a week ago, and on social media they have been able to show how much support the march received, especially from #TimesUp and #MeToo advocates. My statement was not well received. Now, being an opinionated black woman, born without a filter, I rarely retract a statement unless I'm genuinely wrong. I don't want to eliminate what strides a real conversation can make for progress, but if you're wanting to actually have a productive conversation, don't jump onto a post when you're triggered. It won't end well for you, or the argument(s) you are going to make. "Women's rights are the rights and entitlements claimed for women and girls worldwide, and formed the basis for the women's rights movement in the nineteenth century and feminist movement during the 20th century." FEMINISM - fem•i•nism (ˈfɛm əˌnɪz əm) n.
1. a doctrine advocating social, political, and economic rights for women equal to those of men. 2. a movement for the attainment of such rights. Women's rights, by definition, can't be expected to advocate issues that affect the rights of men and male-identifying individuals. Nor can they effectively advocate for race issues. If we are going to put the label there, then the label sticks, no matter what you want to say it is. The problem with labeling your movement in a way that is by definition (like the origin of the word definition) a gender-based exclusive term is that it is....exclusive. It will be unlikely that POC will immediately say "hey, I bet they will fight for [insert race here] issues", or, or anything that is not about that specific gender, such as cultural or socio-economic issues. Expecting a racially exclusive gender issue (like #SayHerName) to be pushed to the forefront more than a widespread gender-based issue (i.e. the gender wage gap) is irrational. The issue that affects a wider number of women supporters will get more focus. There can be effective change if the first response to a differing opinion isn't immediately classifying it as nonsense. Racial division and white supremacy are social constructs, but they still, unfortunately, affect a lot of people, including non-POC. When conversations about real issues that can help people grow are met with arrogance, you cannot then say you are pulling for civil rights and equality. The major problem with stifling conversations like race before they can really be solved is that it excludes a major part of your support base. 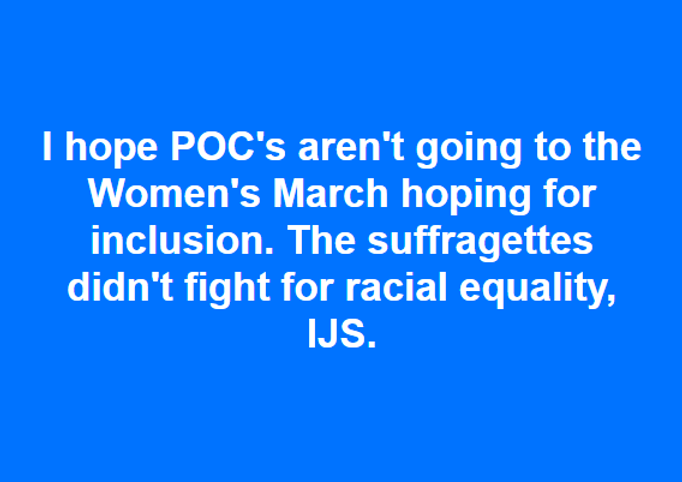 Women's rights can address racial equality as a whole, but going through all the racially specific gender issues would certainly remove focus from the main mission, i.e. women's rights. There is a significant role for non-POC allies to play in race issues, but, if you are not a POC or you do not experience active racial injustice on a regular basis, you cannot say an event represented the full spectrum of POC issues or made a big enough effort to include them appropriately. It is not for you to say it was enough. Even if that makes you feel bad, or makes you think ugly thoughts, it is the truth. If we are needing to have uncomfortable conversations about sexism, and you say the racial inclusion was enough, then it shouldn't be an issue to have an open conversation about this as well. There are a multitude of historical examples of racism within the women's movements, especially in the periods where racial equality was not in sync with the values of those fighting for women's rights. The Suffrage and Temperance movements of the early 20th century are examples of the original women's rights supporters who felt no need to put any minority issue alongside theirs. "Please do not misunderstand. My disappointment had little to do with my sign and chants themselves. It had to do with what white women’s intentional decision to ignore them represented. It represented the continued neglect, dismissal and disregard of the issues affecting black women and other women of color." "The mission of Women’s March is to harness the political power of diverse women and their communities to create transformative social change. " I appreciate this statement, and they go into detail about what they are fighting for and all that, but understandably, the message is getting lost in all the fodder. How would anyone be able to confirm racial inclusion was a major priority among the vague promotional material made readily available? No one could understand what message the march was pushing, outside of anti-Trump messages. That by itself shows the march failed in its messaging, regardless of if there was inclusion of POC. In fact, the person I was having this debate with was one of the organizers of the event. It wasn't until this exchange that I was able to find out that the march was helping ramp up voter registration with minorities and millennials. I was not saying the march was bad: I saw the speeches, like Viola's, Eva's, Cher's, and Natalie Portman's, and was moved. 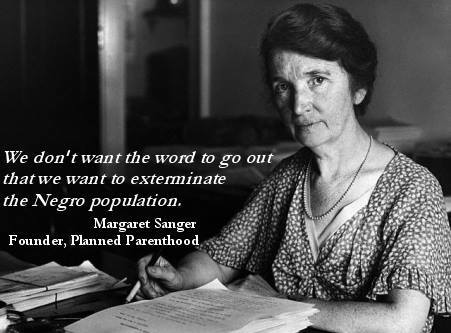 A march is merely a tool of the movement. After the supporters go home, how are they going to know that the movement is effective to their goals, specifically, of racial equality? There is no way to know at first glance. I know I cannot realistically ask anyone to do more to make it more racially inclusive because it is not an all-inclusive platform. It is a women's rights event. What I am asking is when a statement is made that riles you up, think objectively at what the statement is actually saying, instead of what your triggered outrage wants it to say. You cannot say you promote something when your platform itself is for something different. For branding's sake, it will be an addition at best. It cannot be at the forefront. It is not possible without a change of branding. The problem with niches and labels is people will try to twist the definitions and meanings to fit their cause. Sorry to inform you and burst that bubble, but that's not how marketing or reality works. Lastly, if you cannot respect that women's rights include the rights of those women who disagree with you, including the right to be heard and acknowledged, then you really need to bow out of the fight. And to be clear, I am NOT saying women's rights issues do not affect POC, men, etc. I am NOT saying the fight for women's rights cannot help anyone else. Inclusion should not be conditional, and labels both help and hinder that. Regardless, willingness to educate yourself is critical to tearing down walls of bigotry and any lack of awareness. When you limit your scope or refuse to listen, you are doing the same thing to us that you say is being done by sexism and eliminating any validity of any argument you put forward for your platform.